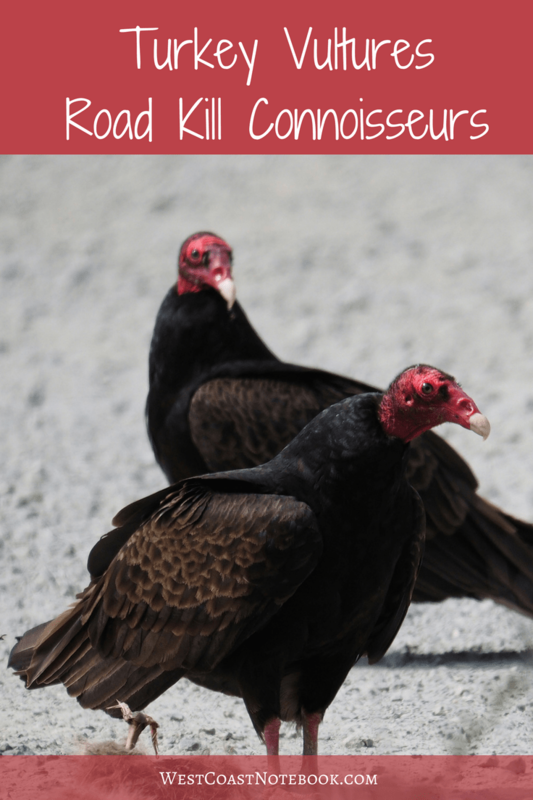 If you have ever seen a movie about the desert, you probably have seen a turkey vulture or black vulture. They are the bird version of a cleanup crew and when someone talks about picking the bones clean, just think vultures. 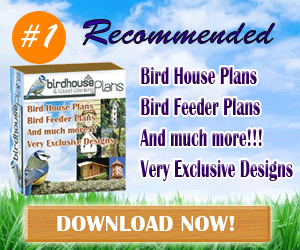 They feed almost exclusively on carrion and lack the talons and sharp claws of other birds of prey. 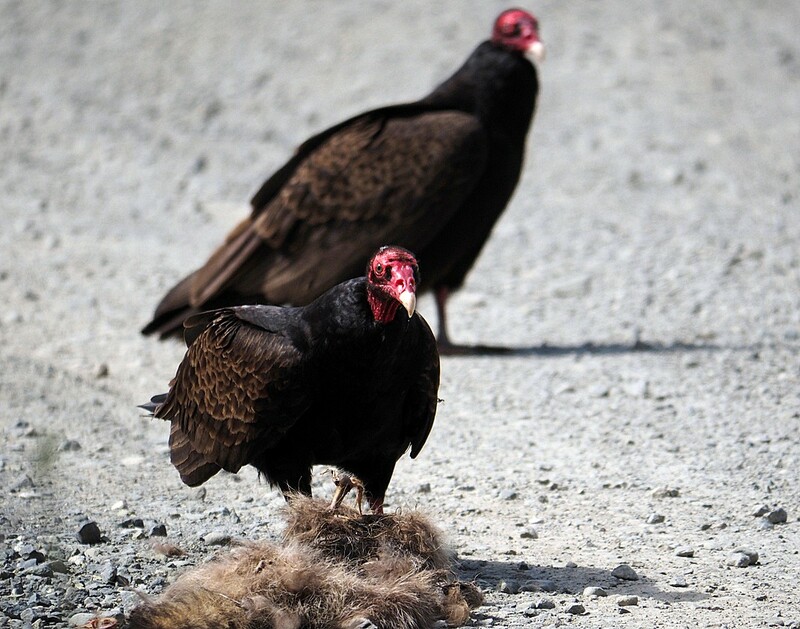 Their feet are meant for walking rather than catching prey and turkey vultures will even stand on their dinner in order to pull off chunks with their beaks. Their bills are long and hooked at the end for tearing off food and their heads are bare of feathers. This is because at times, the bird will literally put their heads into the cavity of their dinner and as they are bald, they can keep themselves clean. 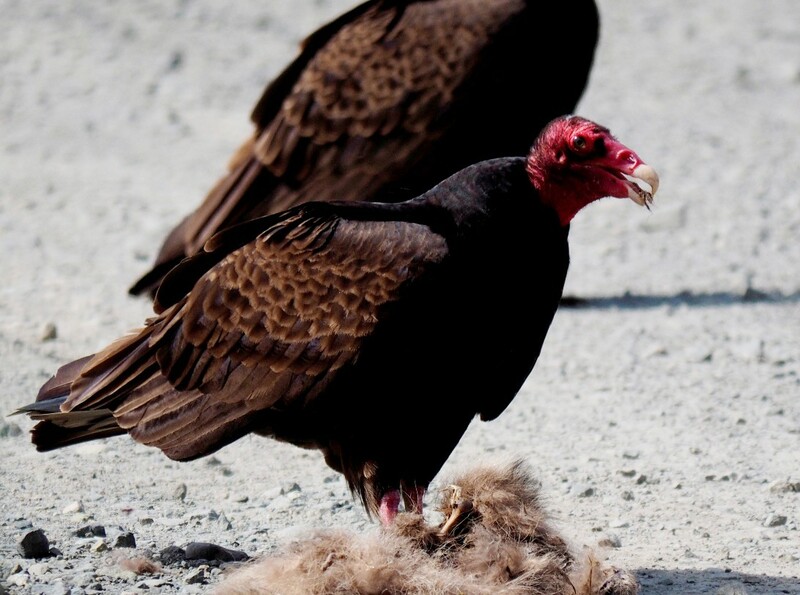 In many cultures, vultures are revered and are used in many burial practices around the world. I won’t go into detail here, but I’m sure you can figure it out. 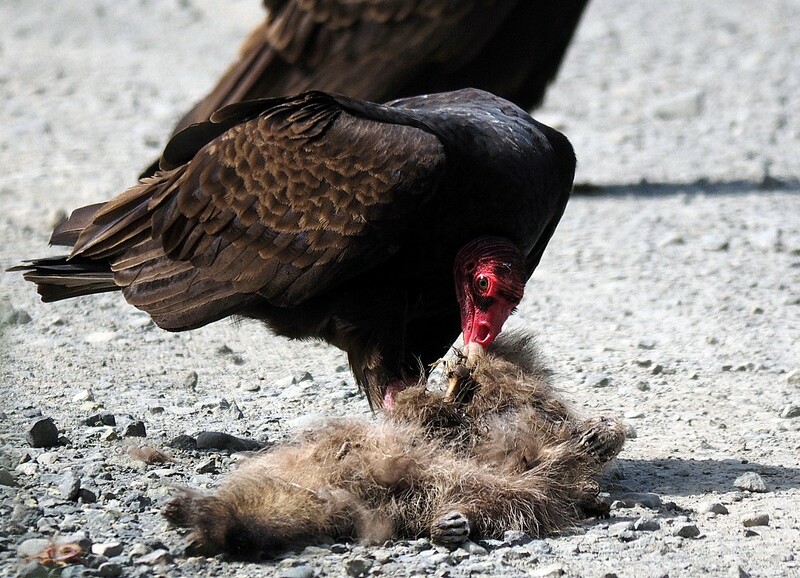 Vultures were thought to bring diseases but in actual fact, they stop more sickness than they start. They do this by an enzyme in their stomach that after eating diseased and contaminated meat kills off dangerous microorganisms and toxins. If you have ever been close enough to a vulture, you would hear grunts and hissing. They are one bird that literally doesn’t have a voice box so those are the only noises they can make. In this area, the vultures leave around the end of September and return in the spring. There are certain spots like Alards Farm where the turkey vultures gather en mass and circle in huge kettles of hundred of birds. They are waiting for the thermals to be just right to leave Vancouver Island and head for Washington State and the mainland. They fly higher and higher until you almost can’t see them and then they all turn and head across the Strait of Juan de Fuca. While driving down the road, I caught a movement out of the corner of my eye so I turned the car around for a second look. And there were two turkey vultures intent on something on the ground and a few more flying overhead. They were on a gravelled side road that had a “NO Trespassing” sign on it and although I had a good line of sight on them from the car, I couldn’t use it like a blind as the road was fairly busy and there was really no place to pull off. So driving further up the road I found a place to pull over and headed back with my camera along the verge. 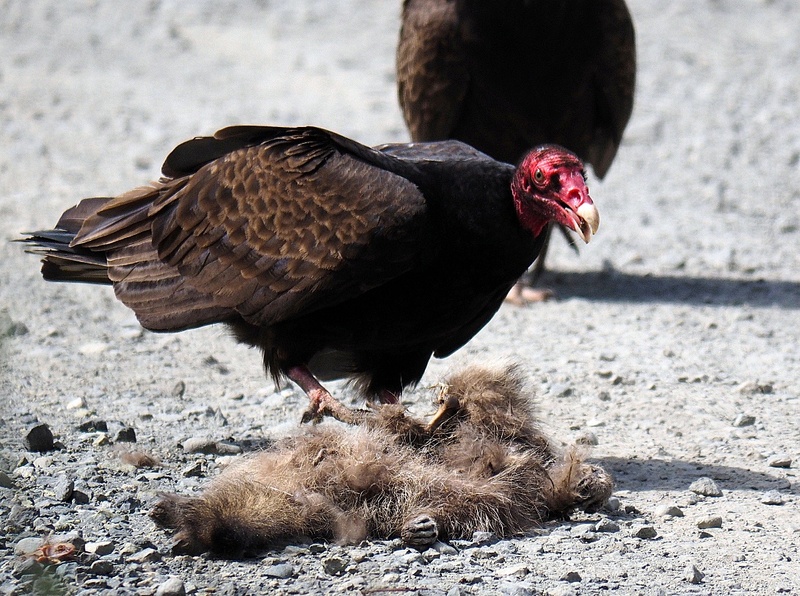 There was definitely two turkey vultures on the ground and I could see them picking at something as I moved closer. They eyed me warily, but I walked a little closer and then waited until they became used to my presence and then edged a little closer, stopping before reaching their comfort zone. I could see now, that they had roadkill cuisine for lunch and in particular a racoon. The racoon looked like it might have been run over by one of the large trucks that drive the road, either that or the vultures had already eaten enough to flatten it out. After watching me and deciding I wasn’t a threat they resumed their meal. 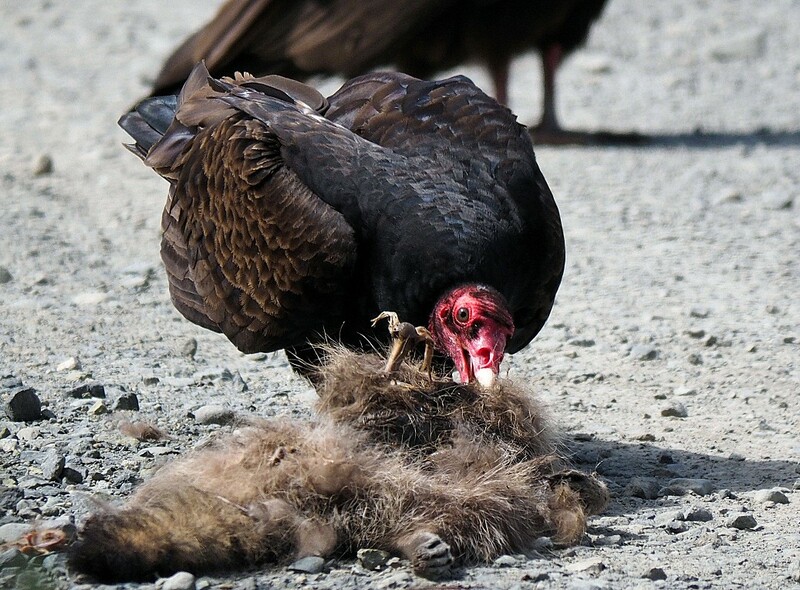 The firs thing the vulture did was to plant his foot on the carcass to hold it down. Then he proceeded to put his head down to get a grip on the meat. And then while holding it down he tugged and pulled until he got a piece off of the racoon. Then proceeded to eat the rewards of his labours. These were the only pictures I got because at this time, a gravel truck signalled to come down the gravel road and the turkey vultures flew off. The driver gave me a funny look, waved and drove on. I waited for a while to see if the vultures would come back, but I could see them soaring higher and higher in the sky so figured lunch time was over. Homely and unloved they may be, but they also have their place and cleanup is their job.